This 3 bedroom home has barrelled brick ceiling as you enter. There are two bedrooms, one with full ensuite bathroom. Another full bathroom on main level has entry into one of the bedrooms and one to the hallway for guests. 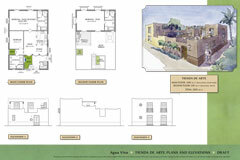 There is a large Living area with a cozy Kitchen and Dining area at one end, for great entertaining and large families. French doors from main living area opens onto a landscaped courtyard with fountain. Washer/Dryer closet and large storage area also on main floor. Upstairs is a very large master bedroom with four piece ensuite, that extends the full width of the home and has plenty of room for a sitting area. The large upper terrace area usually includes a shade pergola and optional cook center with BBQ. Some Aquarias also have a third floor viewing tower. Approximately 2400 sq. Ft. 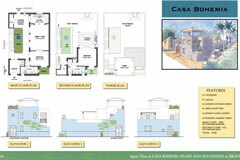 This two bedroom, 2.5 bathroom design is centered on a large courtyard with circular fountain in the main entry. French doors from the Kitchen/Dining/Living Room area to the courtyard provide for outdoor living and enjoying the wonderful climate of Loreto. Main floor master bedroom has full ensuite bath, complete with large round tub, with landscaped side garden for extra light and fresh air. The upstairs master bedroom is large with full ensuite with large round tub, and lots of windows for light and cross breezes. There is a two piece powder room, as well as a washer/dryer closet also on the main floor. The large upper terrace area usually includes a shade pergola and optional cook center with BBQ. Some Bohemias also have a third floor viewing tower. Approximately 2000 sq. Ft. 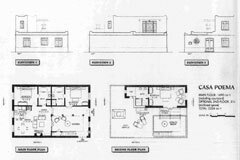 This cozy two bedroom, two full bath design is a great entertainment home. The open concept of Living Room, Dining Room, and Kitchen can accommodate 12 to 20 people for parties in a warm fun atmosphere. Main floor features one bedroom and bathroom connected with main living area. Both bathrooms have tub, shower, and 2 vanity sinks. French Doors open out to the courtyard entrance for privacy and fresh air. Storage space and the washer/dryer are located off the courtyard. Staircase to the upper terrace usually includes a shade pergola and optional cook center with BBQ. The upper bedroom is large with windows and full ensuite bath. Some Chicas also have a third floor viewing tower and extra side gardens. This is the favourite design for singles or couples. Approximately 1500 sq. Ft. 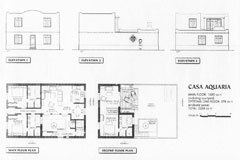 This 3 bedroom design has two master bedrooms with full ensuites, one on the main floor and one on the second floor. Also, a third bedroom/study and separate three piece bathroom with washer/dryer on the main floor. The Kitchen/Dining/Living Room also has a nook area for extra living space or office area, all of which opens onto a central courtyard. The large upper terrace area usually includes a shade pergola and optional cook center with BBQ. Some Encantadas also have a third floor viewing tower. This is our most popular larger Village Home Model. 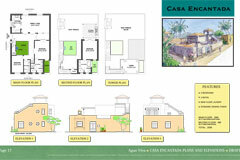 Approximately 2100 sq. Ft. The 3 bedroom Poema is built around a main floor courtyard and another popular model. Main floor Master bedroom is separate with full ensuite and can be used as an office as it is off the courtyard near the front entry. The Living area is also accessed from the courtyard and includes an open Kitchen with a Washer/Dryer closet and Dining area. The second bedroom opens off the Living Room and the attached four piece bath is also accessible from the Living area. The large master bedroom is on the second floor and it has a spacious four piece bath complete with a custom brick copula over the round tub. The large upper terrace area usually includes a shade pergola and optional cook center with BBQ. Some Poemas also have a third floor viewing tower. Approximately 2400 sq. Ft. 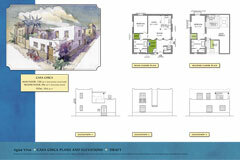 This is a live/work floor plan that combines the main floor layout of the Chica with direct access to 500 sq. ft. retail/studio/office space which is roughed in for a two piece bathroom. The residential area is almost the same as the Casa Chica which is a cozy two bedroom, two full bath design and a great entertainment home. The open concept of Living Room, Dining Room, and Kitchen can accommodate 12 to 20 people for parties in a warm fun atmosphere. Main floor features one bedroom and bathroom connected with main living area. Both bathrooms have tub, shower, and 2 vanity sinks. French Doors open out to the courtyard entrance for privacy and fresh air. Storage space and the washer/dryer are located off the courtyard. Staircase to the upper terrace usually includes a shade pergola and optional cook center with BBQ. Upstairs bedroom and ensuite also has a vestibule for office area. This unit has larger terrace space and some units have third floor towers. Approximately 2000 sq. Ft.